This is a must for any sauna enthusiast! A scrub brush in a sauna is a must! It is a multi purpose tool. By lightly brushing the body's skin, you cause an increase in blood flow to the surface. This in turn help stimulate the entire body including increase the heart rate. The scrub brush also serves to gently exfoliate the skin and clean the pores. Flip the brush over and you have a gentle massage brush to help lightly massage sore muscles and tissue. 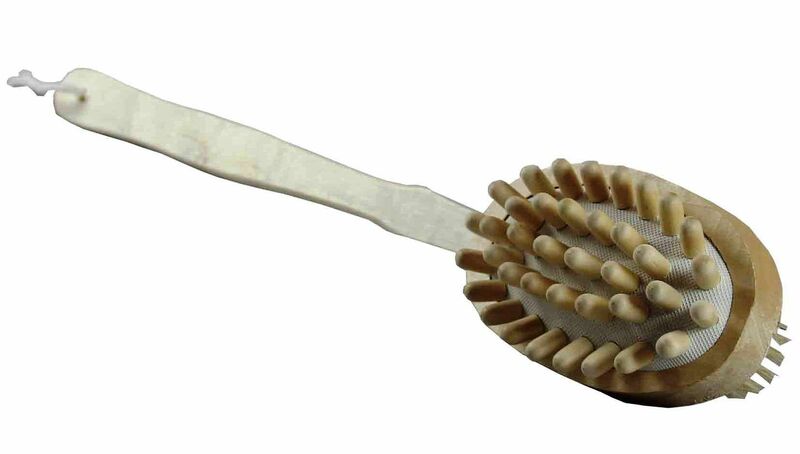 This brush has a long extended handle to allow bathers to easily reach the hard to get places such as backs and shoulders. When your done simply hang the brush up on the wall with its built in hanger. The handle removes and you can use it as a hand scrubber. Measures - handle length 11.5" | massage head 5" x 3"
Stimulating the skin is a sauna practice that goes back 1000s of years. The Finnish use a device called "Vihta" - a Finnish term for a sauna whisk. This whisk was traditionally made from Birch branches. The Vihta is used as a fan to move the air within the sauna. Sauna bathers also use the Vihta to lightly 'whip' ones skin surface. This forces the heat further into the body and also stimulates the skin surface increasing blood flow.